Aaaah, coffee. The beverage of the gods and the required kickstart for my days. 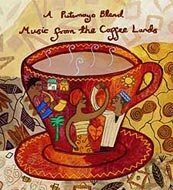 A nice atmospheric soundtrack to your morning java respite is the lovely Putumayo compilation entitled Music From The Coffee Lands: an aromatic blend representing Peru, Kenya, Hawaii, Uganda, Mexico, Colombia, Zimbabwe, and more. Sounds like . . .
Kothbiro - by Kenyan lyre (nyatiti) player Ayub Ogada. Haunting. The slack-key Hawaiian guitar piece by James "Bla" Pahinui and the feisty "Guajira Bonita" track by Julian Avalos & Afro-Andes that opens the CD are both also favorites of mine. Check this one out. 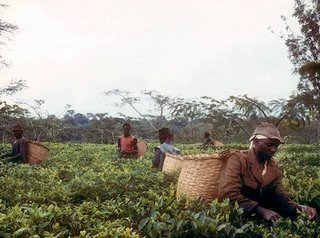 To learn more about where your favorite drink comes from, and to buy fair trade blends, check out Cafédirect. I used to manage a coffee house and we would play these cd's often. Thanks for the trip down memory lane. 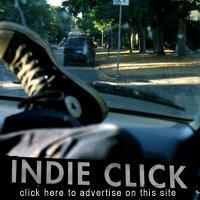 I seem to be stopping by your blog daily now so i added you in my links. Keep up the great work. get on AIM sometime, i have to talk to you about something. Nice site good music.Enjoyed it.michaelangelohsheaven.blogspot.com if you care to stop by.There is a few songs posted .Thanks for the visit here I enjoyed it.